Our new CloudLab printQ 3D Packaging Design has been recognized for a major industry award. 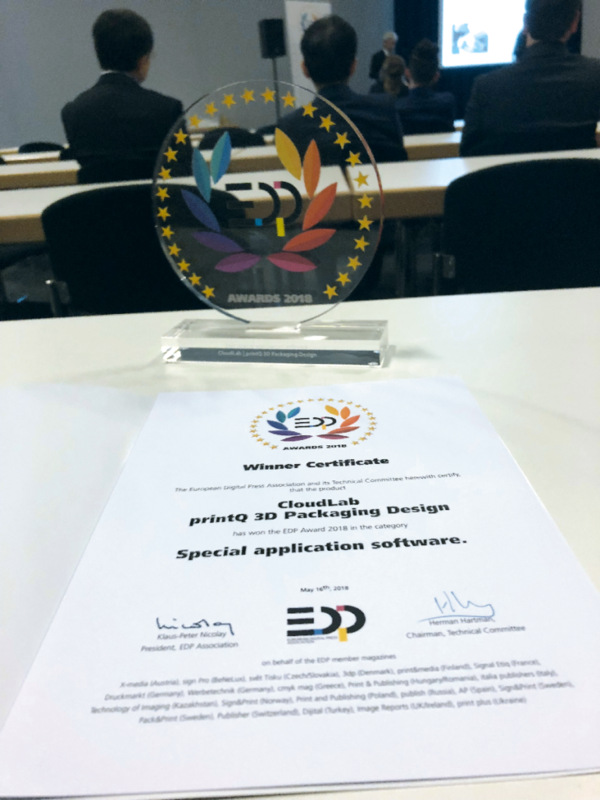 We received the award on May 16th during the FESPA Global Print Expo 2018 in Berlin. Our new stand alone 3D editor was released in late 2017 and allows anyone to build and design their packaging themselves. In our editor library we offer ECMA packages, which you can use as the foundation for their own design adding their own branding elements online. All sorts of graphical content and customizable sizes and shapes for the product are possible. With, height, depth and potentially substrate thickness – although this can be automatically calculated for the user based on their selection of substrate – are the only values you need. The key innovation is the dynamic creation of a 3D model. It is possible to design a variable sized packaging product according to your individual requirements and artwork. Thanks to the instant preview that is generated dynamically you will see what you get: a realistic 3D visualization of your own packaging product – in any size. Nico Olejniczak, Head of Sales and Marketing was honored to accept the EDP award on behalf of the whole team. EDP is comprised of industry experts representing 21 Trade Journals focused on digital technologies impacting the printing and graphics industry. Their selection of CloudLab 3D Packaging Design confirms that our development efforts were on target and will have broad worldwide appeal delivering tremendous value to our clients.